The proud look on my little ones’ faces when they make something for the family (or themselves) to eat is none other than priceless. And it’s even cuter the younger they are! Although my big kids can do quite a lot in the kitchen and have quite a list of recipes they can make, what about the 2, 3 and 4-year-old crowd? 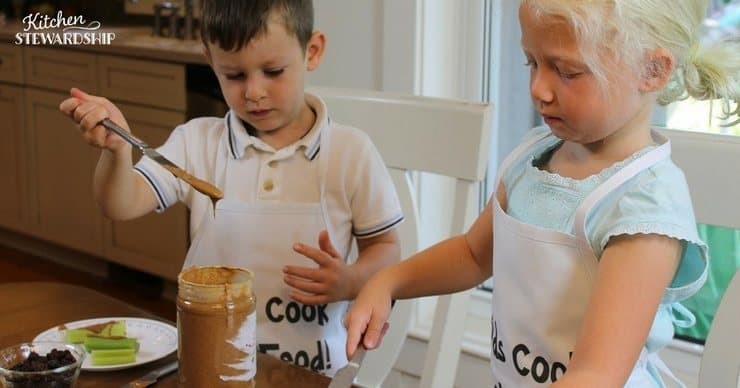 It doesn’t seem like they can do much in the kitchen other than dump ingredients and help stir while an adult is baking…but I believe they can do so much more. 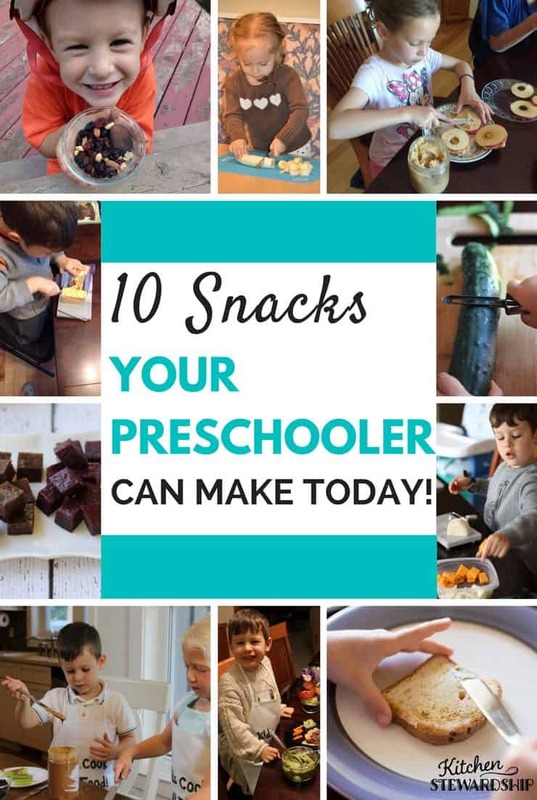 With a few basic skills and some special tricks, preschoolers can make healthy, fun snacks by themselves, plus breakfast and some lunch foods too. It’s all about us parents allowing them some options, trusting that they are capable, and getting out of their way once we know they have some skills. 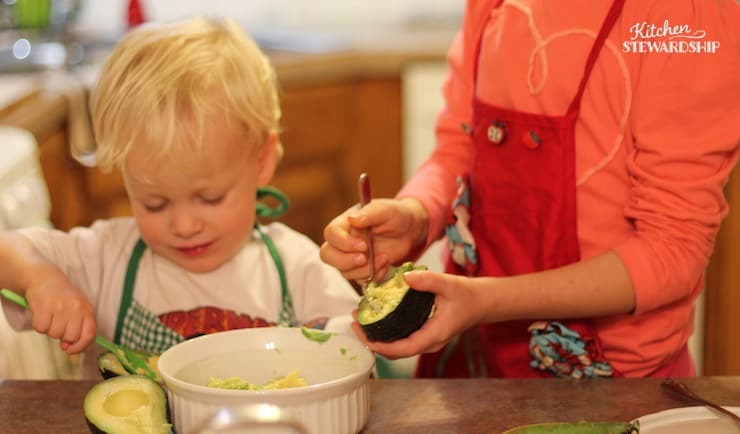 Is it Important to Get Young Kids Involved in the Kitchen? OH my heavens, yes. If you’ve got a child under 5 years old, you have an opportunity like no other. Research shows that kids who do chores regularly at young ages have higher self-esteem, are more independent adults, and perhaps most importantly for frazzled parents, are more willing to help around the house as children. You know how little ones are always asking, “Can I help?” and we far too often shoo them away because it’s faster to do it ourselves? When they’re old enough to be helpful, they won’t want to anymore. People in other countries have proven that if we can simply keep that motivation alive, basically not “break” the chain by allowing them to be helpful, they will continue to be motivated as they grow. Shoo them away, and you’ll sabotage your chances later. And be sure not to offer rewards for helping or give them “fake” tasks like sweeping after you’ve already swept (source). Ready to say “YES!” the next time your little one wants to be near you and help out? 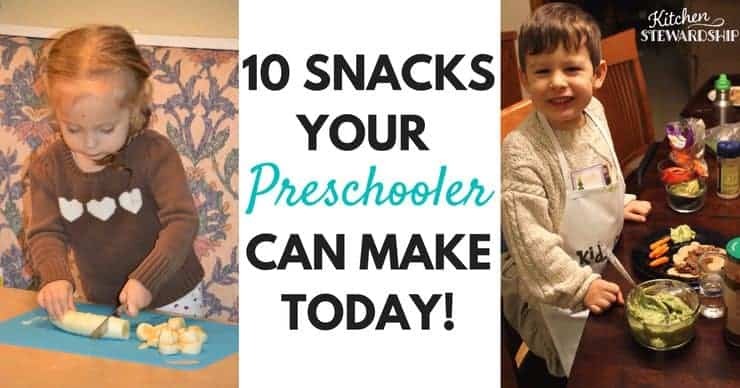 Check out these 10 awesome snacks that little kids can make, either completely independently or with just a bit of parent prep! 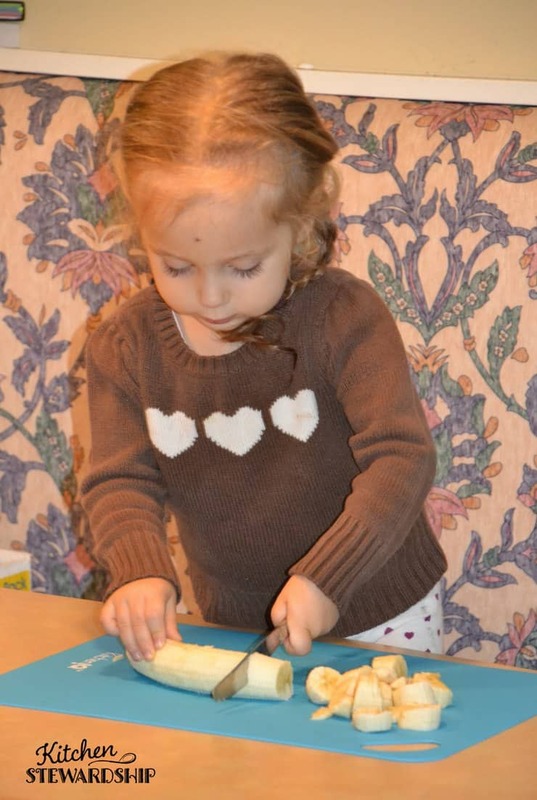 In the very first Beginner class in our Kids Cook Real Food eCourse, the kids learn to spread with a butter knife. As long as you have a small tolerance for a sticky mess, your 3 and 4-year-olds can spread peanut butter on celery, and they’ll love placing the “ants” down the log (raisins or dried cranberries). This photo is from the very first time Mary’s daughter got to do the Kids Cook Real Food classes because she turned two. She was so excited and ready to do what she had watched big brother and sister do already! Look how awesome she’s doing! We teach kids very safe knife skills and see dull knife skills like slicing bananas as an important prerequisite to the techniques they’ll need for sharp knives. I highly recommend teaching your young one safe knife handling rather than just handing them a butter knife simply because you know it won’t hurt them – you can enroll in the course to see best how to do it! Just don’t wait until your child is seven before handing them a dull knife, if you can help it. The classic PB&J is possible once spreading skills are in effect, but in our family we don’t often have bread around. It’s super fun for little ones to spread nut butters (or cream cheese) onto bananas they’ve just sliced and eat them like little Oreos. 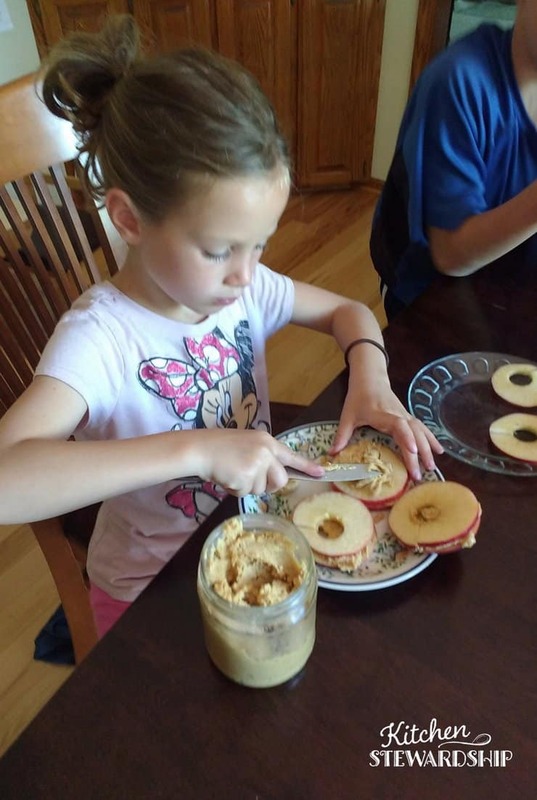 My kids fawn over anything they can make with our Victorio apple peeler gadget (found on Amazon), and peanut butter apple sandwiches are definitely a favorite kid-made treat. They need a little help with the gadget, but man do they enjoy turning the crank themselves! My 8-year-old is the one demonstrating in the photo, but my 4-year-old can do it too. Save these snack ideas for later! Download the ideas in this post as a printable PDF! 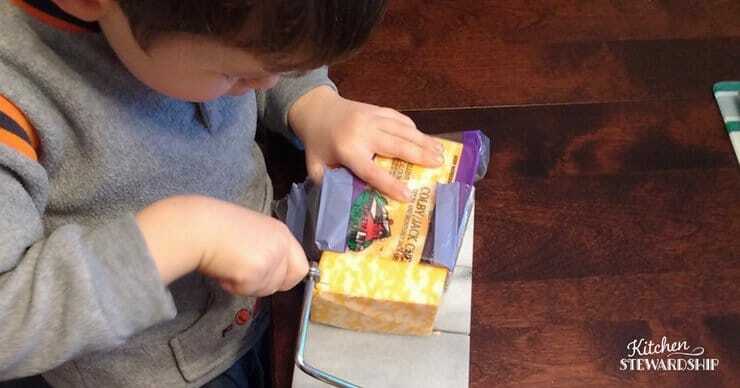 This cheese slicer is such a kid-friendly tool. It allows kids to really control the slices and not hurt themselves, and they’re totally independent (although he often runs out of motivation after slicing enough for himself). Little ones can also help roll and cut homemade crackers, although that’s not a totally independent recipe until a bit older. My 4-year-old was so proud that making “jello” is “his job.” We use the pouring skills from the eCourse to enable little ones to be big helpers on this simple recipe, and kids who are just a bit older can do the whole thing themselves once they’re trained at the stove. The cutting is all for the little one though – lower the bar on your standards for perfect squares and let your preschooler have at the gelatin (use the coupon KS10 for 10% off!) with a butter knife or cookie cutters. The photo above are like “gummies” or fruit snacks made with blended fruit, but we also make a style that looks more like finger jello with 100% fruit juice. Little ones can easily slide a butter knife through either version and have a blast doing it. 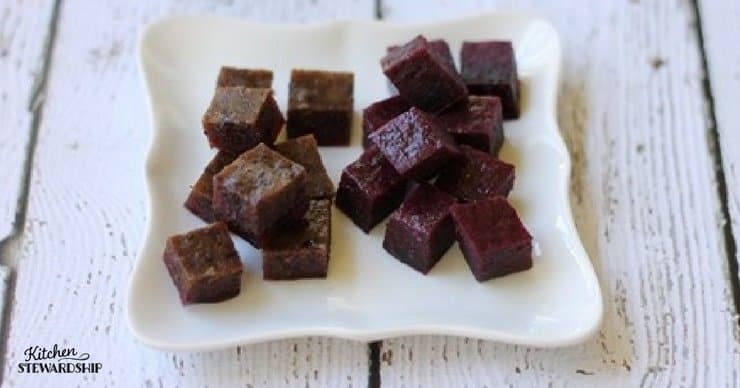 Both recipes are super healthy and include grassfed gelatin, a great source of protein, amino acids for gut health, and collagen (use the coupon KS10 for 10% off!) for joint, skin and hair. Best part? It looks just like what the other kids are eating. The slicing and pouring skills come together in this grain-free, high-nutrient alternative to morning cereal. Hat tip to Jessica at Good Cheap Eats for the inspiration for monkey salad. We make it non-Paleo or Whole30 compliant but cut the milk and you’re back in business for those diets. 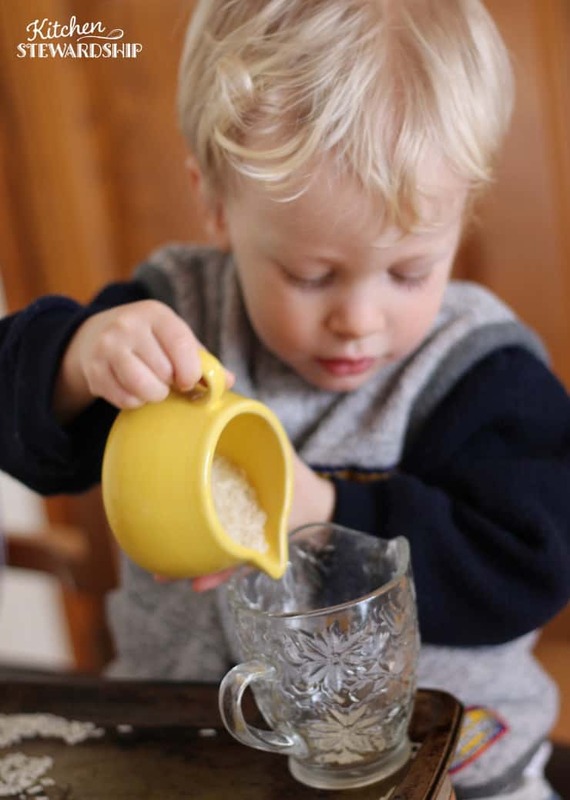 We put milk in a small creamer container or liquid measuring cup to make it easy for little hands to pour their own – and get seconds, the parents’ bane of existence at the dinner table. Monkey salad is an awesome breakfast and an even better healthy after-school-snack for kids when they can put it together themselves (pouring is taught in the Beginner Level of our eCourse as well!). Spreading skills are back again for this simple breakfast or snack – it’s a special treat around here when my mom visits and brings homemade bread, because we don’t do much bread at all anymore. My kids fight over who gets to butter the toast (or jelly or raw honey). An adult is probably needed for the toaster on this snack, so it’s not 100% preschool-child-made, but pretty close. 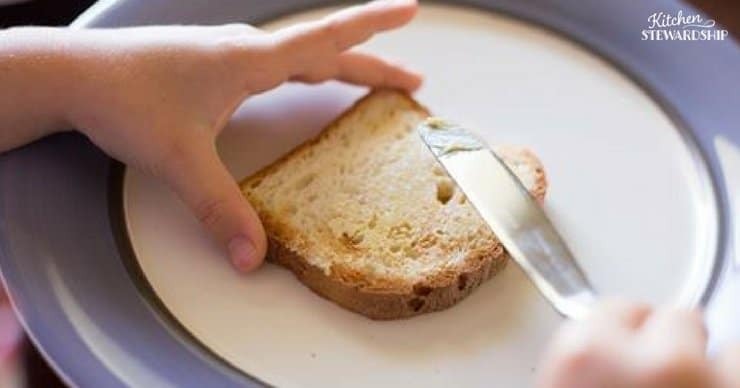 If the bread is soft enough to not need toasting, just make sure the butter is room temp and your little one will have another independent snack to enjoy and can even help prepare bread for the family at dinner (think buttering grilled cheese, garlic toast, etc). When John asked for a snack on the day of that very-proud-looking picture, I had him put a second batch in a reusable bag for the next day’s school snack. Score and double score! 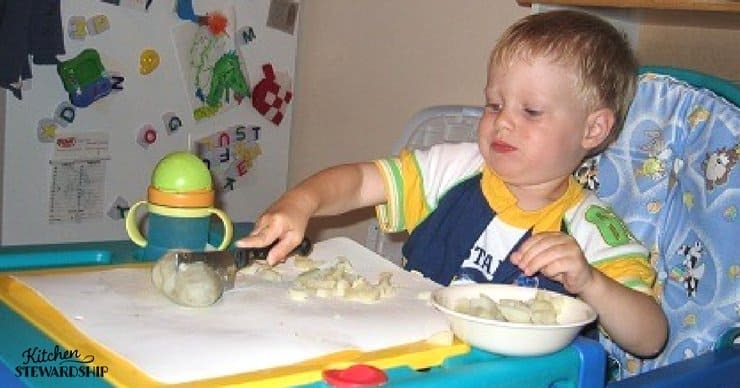 Even very little ones can learn to be safe with kitchen tools and have the dexterity to cut very soft things. Preschoolers can be taught to peel hard-boiled eggs too. Give them a little bowl of water to spin the egg in after cracking it all around, and the water will help the shell come off more easily. Then they can use a butter knife or cheese slicer to cut the egg in half or in chunks for their own lunch or snack. I cannot describe how proud my 3-year-old was to start learning the skill of guacamole making. It’s kind of been our stand-by “kids can make this” thing for years, and the responsibility gets passed from kid to kid when they turn around 4 or 5. He had to learn proper measuring skills (we make it easy in the Kids Cook Real Food eCourse with our special kid-friendly language), how to scrape the avocado out of the shell (challenging but possible), and how to stir properly or use an immersion blender (his favorite). We eat our homemade guacamole with carrot sticks and other dipping veggies at dinner or with any Mexican meal or chips and salsa. We eat it a lot and I love having 4 kids who know how to make it! The only part I do for Gabe is cut and pit the avocado (or my two oldest kids can do that part too). Bonus: Preschoolers Can Help With Dinner Prep Too! And this Instant Pot mac n cheese recipe is perfect for inviting preschoolers to assist in making. They’ll feel so proud that they helped make dinner! 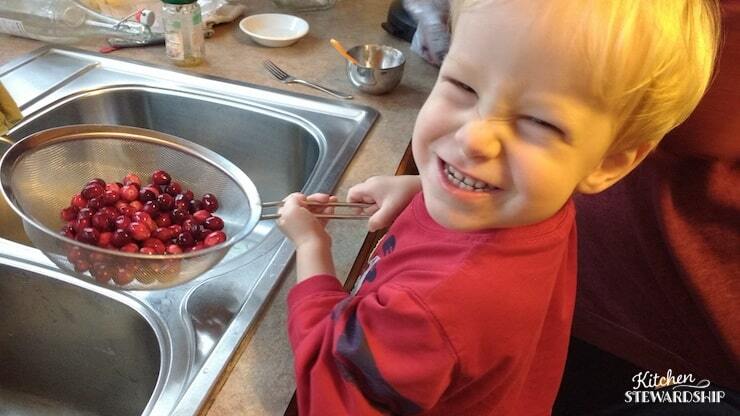 We’ve enlisted the help of very young children to tear and wash lettuce leaves for salad (they love using the salad spinner too if you have one of those) and here’s Gabe thoroughly enjoying washing some cranberries for our morning oatmeal. We enable even little ones who can’t read to be able to make entire spice mix recipes on their own with our special recipe cards and system. 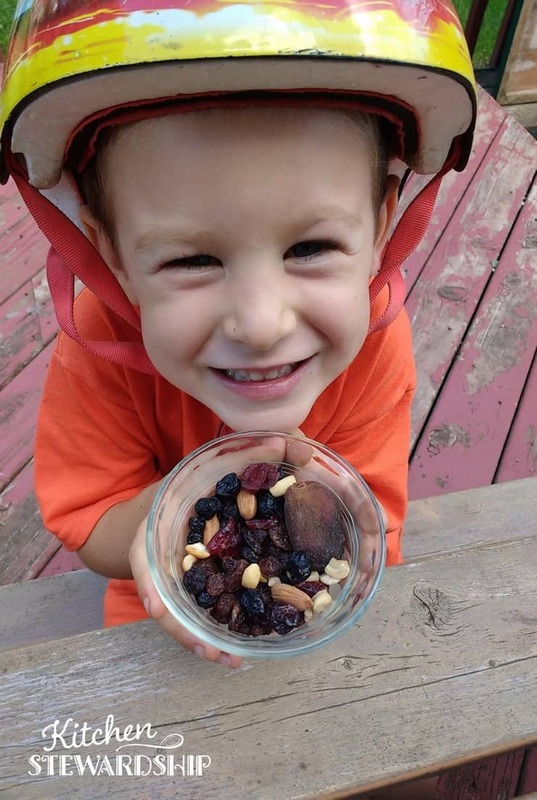 Do you have favorite snacks your preschooler can make on their own? Would you let them try some of these?